Vinyl Soft Play Area Products - We offer vinyl soft play ball pits and hollows that can be combined with other soft play products or used on their own to promote active play for children. Available in sizes for infants, toddlers, preschool and custom sizes. Balls also available. Made of dense virgin polyurethane foam that meets all US and European Flammability requirements. Perfect for Play areas and more at Hotels and Resorts, Daycares, Home Use and More. We offer vinyl soft play ball pits and hollows that can be combined with other soft play products or used on their own to promote active play for children. Available in sizes for infants, toddlers, preschool and custom sizes. Balls also available. Made of dense virgin polyurethane foam that meets all US and European Flammability requirements. Certified Greenguard Indoor Air Quality and Children and Schools Certification. Tested to preserve indoor air quality. All products are covered with bright 14 ounce Nylon Reinforced vinyl, Naugahyde Expanded Vinyl or 32 Ounce Coated Material chosen for the use and age of children intended for the soft play product. All covers are easy to clean and come with a 1 year warranty. Custom Orders also Available. Our floor play mats and activity mats are a perfect compliment to these soft play products - go to Play area Products - Floor Mats, Carpets and Floor Cushions. A gentle nestling place for infants through toddlers. Reversible play cushion. 9 1/2” high, 45” diameter, 3 1/2” thick. Pastel and Primary. Soft nesting center for infants and toddlers. 9.5” h x 45” dia. with a 3” thick reversible cushion. 5” h x 15” l smiling face provides perfect size seat for step into soft play. 4" Thick Soft Foam sides enclose 160 balls, included. 10" High and 36" Diameter pool is perfect for Toddlers up to 3 years. 6 flower petals varying from 3"h to 12"h help teach color discrimination along with spatial relationship, as little ones climb up, down and around the center ball pool which has 28" inside diameter with 4" thick x 12"h soft foam walls that enclose 120 blue balls. Perfect for 6 months old thru 2s. Floor space 64" dia. Perfect resting or nesting place for all ages. 16” high sides, 6” thick to hold crawlies and toddlers yet entice participants searching for an enclosed special place. Folds up for easy storage. Dense foam provides natural vista for cavorting sea animals. Foam-filled walls Easy to set up and easy to store, the Play Yard comes in two folding sections. Two industrial-strength zippers open and close the walls. 69” square inside and 81” square outside. 6” thick and 18” high. Six inch thick softly dense 16” high sides contain 1000 multicolor 2-7/8” polyethylene hollow balls for body surfing and tummy tumbling. Big enough for ages 2 to 6 to explore their own marvelous bodies in an evershifting sea of moving shapes. Gentle sea creatures share this refuge with child participants. 6 feet square outside footprint. 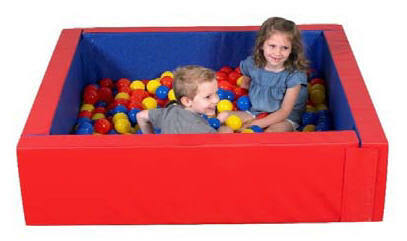 Our ball pool for ages 3 to 6 --INCLUDES 500 balls, 3” dia.. in 3 colors, provide multi-sensory tactile stimulation as preschoolers balance, adjust and move through them. 4” thick foam walls 14” h. and requires 53” square floor space. Pricing For Ball Pools includes Balls - Pricing for Hollows does not include balls. Items available without balls - for pricing contact us.